For calendar year 2014, according to the National Immunization Survey-Teen, 60.9% of North Dakota girls aged 13-17 had received at least one dose of human papillomavirus (HPV) vaccine, and 41.7% had received three doses. Among boys, 37.6% had received at least one dose of human papillomavirus (HPV) vaccine, and 25.3% had received three doses. These rates are much lower than North Dakota’s Tdap vaccine coverage rate (92.1%), which indicates that many opportunities to give HPV vaccine are being missed. Although the state health department, local public health clinics, and pediatric providers feel immunizations are a high priority, HPV vaccination rates are stagnant and unacceptably low compared to the Healthy People 2020 goal of 80% coverage for girls. The NDAAP is participating in a HPV Quality Improvement project in partnership with Minnesota, South Dakota, Wisconsin, Kansas, and Iowa. MOC credit is available for NDAAP members. If you or anyone in your practice would like to take part in the project (do not have to be an AAP member; do not have to be a physician), please contact Kylie. More information below. Want to improve HPV vaccine rates at your clinic? The North Dakota Chapter of the American Academy of Pediatrics (NDAAP) and its partners are seeking North Dakota clinics who want to improve their HPV rates in pre-teen boys and girls (ages 11-12 years). Participating pediatricians will receive MOC4 credit (25 points) through AAP (pending approval 2.16) Pediatric clinician sign up for project by emailing Kylie. Participants must sign up before May 1, 2016 to participate and receive MOC4 credit. Participating pediatric clinicians will receive quality improvement tips and participate in a Midwest regional ‘virtual learning collaborative’ to improve HPV and adolescent vaccination rates. Clinic participation- what is involved? Pediatric clinician sign up for project by emailing Kylie . Participants must sign up before May 1, 2016 to participate and receive MOC4 credit. Review Quality Improvement online resources (1 hour) in the HPV Quality Improvement toolkit and sign up in the AAP QIDA data system for recording audits. AAP membership is not required, but chapter membership is encouraged. Complete two (2) follow-up audits within two consecutive months of the baseline audit before September 1, 2016. This project is in partnership with the following groups to improve HPV immunization rates among pre-teens. NDAAP has limited funds to implement this HPV vaccine quality improvement project through September 2016. List of HPV Web-Based Resources compiled and reviewed by the NDAAP. The District IV plenary session by Dr Jimmy Roberts and Dr Charlene Pope was videotaped​ and can be accessed at www.vimeo.com/avwired/aap with the password: aap2015. Review feedback: This 52-minute video talks about research done on teenage vaccine hesitancy (HPV) in South Carolina/Oklahoma. Was very difficult to hear presentation. Dr. Pope spent majority of time discussing information about communication issues/techniques in the office visit. This course will discuss strategies for strongly recommending the HPV vaccine and will offer information to help pediatricians address their patients’ concerns about the vaccine. Employ communication strategies on a daily basis to aid parents in making a decision to vaccinate their adolescents against HPV. Answer Frequently Asked Questions about HPV vaccination with accurate, succinct, and compelling responses. Review feedback: Takes a while from order time to be able to start class due to processing time required through AAP website. This was a very nice presentation that took a little less than an hour to view, with additional time for testing, evaluation etc. to complete the program. Questions were embedded along the way to help with knowledge retention. CME was available (1 hour). I LOVED the approach to recommending HPV vaccine and learned some tips from this. Registration Fees: No fees are charged for CDC’s CE activities. This module is the eighth in a series titled Immunization: You Call the Shots and focuses on HPV and its related vaccines. The series has been available since the mid-nineties in various formats. The series is designed to provide key immunization knowledge in a very basic step-by-step manner. It presents practice-oriented content about immunization. It does not discuss the denser more complex material regarding epidemiology, disease transmission, etc. It addresses an important audience for immunization training: the new provider or the medical or nursing student. It is also an excellent review for a seasoned healthcare provider. For HPV, describe this disease, including the causative agent. For HPV, list the groups at highest risk. For HPV, identify those for whom routine immunization is recommended. Review feedback: The contents on this link were easily accessible, however, it took many hoops to obtain the 1.25 hours of CME. Much of this content was unique from the information in the above tutorial. This too had embedded questions. This information also included vaccine storage information, so perhaps would be one of the most useful tools for nurse providers. Low HPV vaccination rates are leaving another generation of boys and girls vulnerable to devastating HPV cancers. Vaccination could prevent most of these cancers. CDC is looking to you to make an effective recommendation for HPV vaccination when kids are 11 and 12 years old. 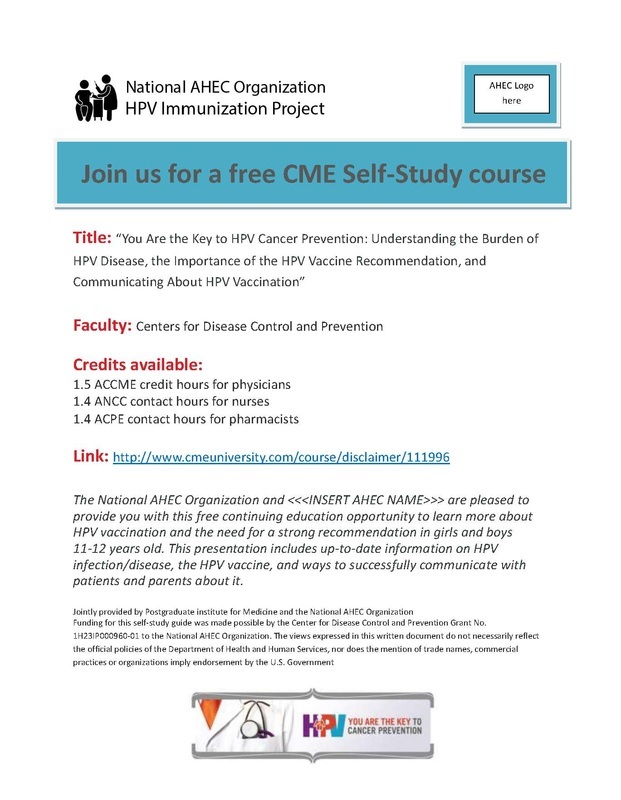 Provided in this presentation is up-to-date information on HPV infection/disease, HPV vaccine, and ways to successfully communicate with patients and their parents about HPV vaccination. Find out how to reduce missed opportunities by recommending HPV vaccine the same way and same day you recommend other routinely recommended adolescent vaccines. Explain in plain language, the importance of HPV vaccination for cancer prevention and the rationale for vaccinating at ages 11 or 12. Provide an effective recommendation for HPV vaccination. Describe useful and compelling information about HPV vaccination to succinctly answer questions from parents and aid parents in making the decision to vaccinate their children. Review feedback: This presentation was worth 0.75 hrs of CME, which was the approximate time it took to try it on 2 different computers before it would play. The information is consistent, but redundant to the other presentations and presented in a bit less of an appealing manner. Many hoops had to be jumped through to obtain the CME. This activity is a roundtable discussion on HPV vaccine developed for distribution on Medscape. Description: For physicians, nurses, and pharmacists who recommend or provide vaccinations to preteens and teens. The goals of this activity are to increase clinician recognition of the burden of HPV-related disease and to increase understanding of Advisory Committee on Immunization Practices (ACIP) recommendations for HPV disease prevention through vaccination. Review feedback: HPV vaccine powerpoint (unscripted)- brief- took 5 minutes to update software/download and 5-10 minutes to review slides. Good concise content. Review feedback: Re-framing the HPV Vaccine - this video took 13 minutes to watch. It was sponsored by the MN Dept of Health and is a super way to review vignettes involving vaccine presentation to patient/families. Very efficient use of time. The important statistics were also included in these vignettes.